The smoky sweetness of grilled vegetables is enhanced by a roasted garlic and balsamic vinaigrette. This salad is atasty vegetarian meal that everyone at the table will enjoy. Brush first 6 ingredients with olive oil. Grill fennel and onion on direct medium heat for about 25 minutes, turning occasionally, until tender. Grill eggplant, zucchini and peppers for about 15 minutes, turning occasionally, until tender-crisp and browned. Let stand until cool enough to handle. Cut fennel and onion into 1 inch (2.5 cm) pieces. Cut eggplant, zucchini and peppers into 1 1/2 inch (3.8 cm) pieces. Brush bun halves with olive oil. Grill for 1 to 2 minutes until toasted. Cut into 1 inch (2.5 cm) pieces. 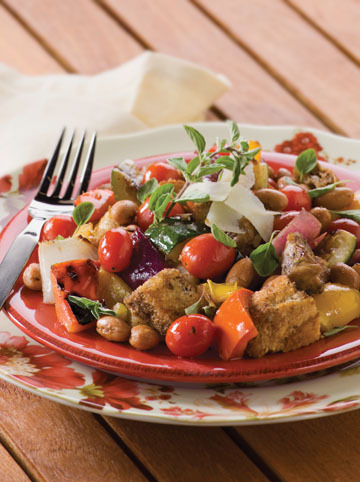 Combine beans and tomatoes with vegetables and bread cubes in a large bowl. Combine remaining 6 ingredients. Drizzle over salad and toss until coated. HOW TO ROAST GARLIC (OVEN METHOD) To roast garlic, trim 1/4 inch (6 mm) from each bulb to expose tops of cloves, leaving bulbs intact. Wrap bulbs individually in greased foil and bake at 350°F (175°C) for about 45 minutes until tender. Let stand until cool enough to handle. Squeeze garlic bulb to remove cloves from skins. Excess roasted garlic can be wrapped and stored in the freezer. TIP Quartering the onion with the stem still on helps the pieces stay intact during grilling. The core of the fennel serves the same stabilizing purpose.